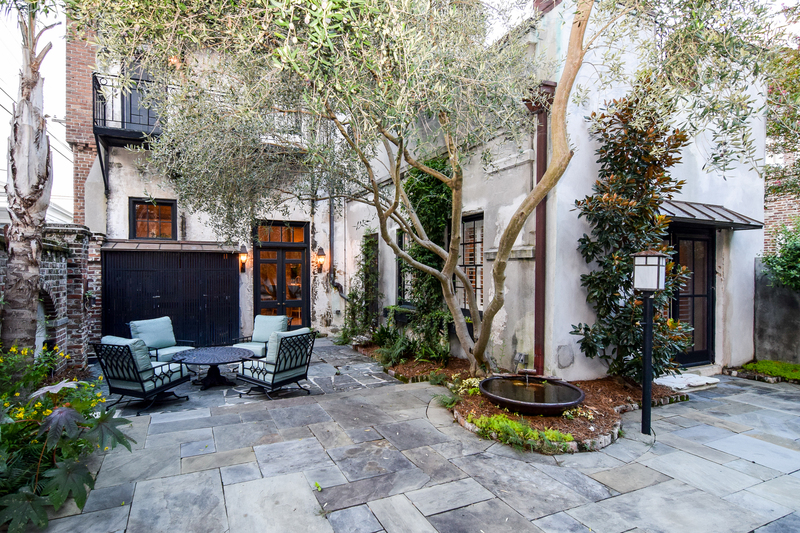 This downtown Charleston property at 45 Hasell Street, listed by Robertson Allen, combines a rich history with stunning updates to create a truly unique property. Sitting on the corner of Hasell and Anson Streets in the heart of Ansonborough, this eye-catching brick building has a rich history. The building was originally constructed in 1851 by Charles W. Seignious and served as a store and dwelling. It was renovated in 1965 by the Historic Foundation but kept the storefront pattern (including the stone lintel and cast-iron pilasters) as well as the first-floor shop windows. 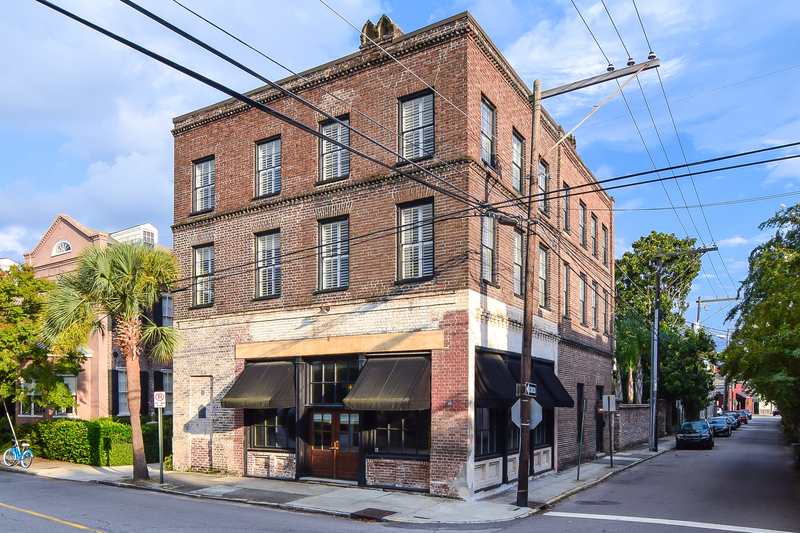 The property was also renovated in 1994 and has been awarded a Carolopolis Awards by the Preservation Society of Charleston for its historic integrity. Because the home originally served as a store, the space is incredibly open and light-filled. 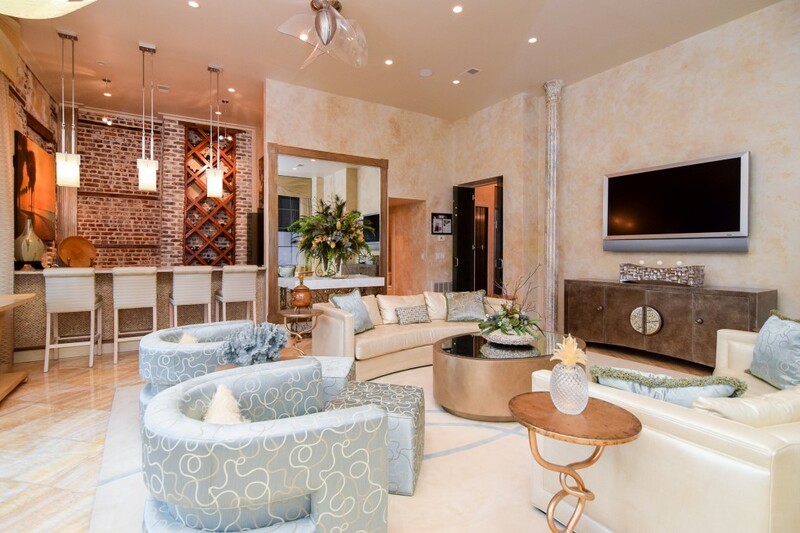 Entering from Hassel Street, you are greeted by the expansive living room—which is a great place to entertain. Luxurious onyx flooring plays off the natural light and tall ceilings make the space seem even more expansive. A wet bar, complete with built-in wine storage, a granite-topped bar and a brick accent wall, anchors the room, and electric blinds on the oversized, storefront windows allow for privacy. Just beyond the living room is another cavernous space which is occupied by the kitchen and dining room. Soaring ceilings, historic brick walls and pilasters allude to the home’s commercial history but it has been transformed into an inviting entertaining space. The modern kitchen has been outfitted with top-of-the-line appliances, custom cabinets and granite counters and is open to the dining room which has room for a large 12-person dining room table. There is also one bedroom suite on this floor. One of the best features of 45 Hasell Street is its abundance of outdoor living spaces. Extending from the dining room is a secluded yet sizable blue stone courtyard. 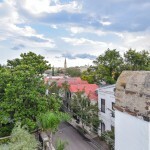 Lush greenery and palmetto trees add color to the space and brick half walls block views of the street while still allowing for great sunlight. A parking pad is located behind an electric gate and has room for at least two cars parked in tandem. The space flows seamlessly from the interior, making it an ideal spot to host a spring or summer gathering. In addition to the expansive patio, there are several other outdoor living spaces to enjoy. Off of the second floor hallway is a large patio which overlooks the blue stone courtyard below. Small Shakespearean balconies are located off of the second floor guest suite and third floor kitchen and a rooftop terrace offers unobstructed views of Charleston rooftops, the harbor and the iconic Ravenel Bridge. The majority of the bedroom suites are located on the second and third floors of the home. A well-sized sitting area is found on the second floor landing and makes for a perfect media area—complete with a wet bar. 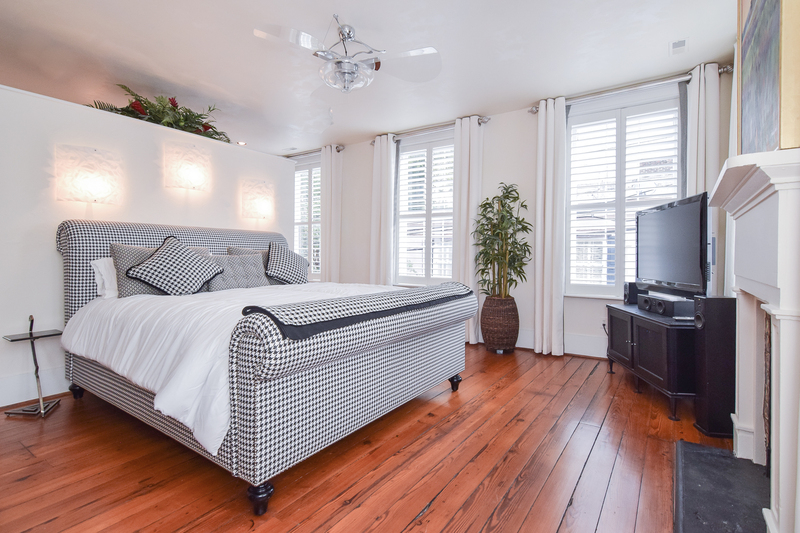 The master suite overlooks Anson and Hasell streets and is filled with natural light. Original hardwood floors and a fireplace add historic charm and there is a separate office with two walls of built-in bookshelves. The renovated en suite bathroom is a great mix of modern and whimsy. 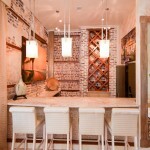 Hardwood floors and a tiled shower anchor the room while playful starfish cabinet pulls and a fireplace add cozy charm. There is also a second bedroom suite on this floor with a Shakespearean balcony overlooking the courtyard. The third floor of the home mimics the second with a loft-style media room and two guest rooms. 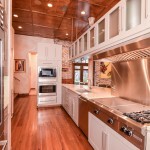 A full kitchen, complete with granite counters and stainless steel appliances is perfect for guests. A video tour of the property is included below to give you a better sense of this unique home. To learn more or set up a showing, contact listing agent Robertson Allen.